Since 9/1 we have had 8 positive breadth days, 5 of those with 100+ stocks up greater than 4% or more. Last time this occurred, it was back in early July, and prior to that starting June 10. Each time, the indexes hit resistance right at the levels we are approaching. Yah yah, nothing new, every blog you read is talking about it. Will we break through? Will we bounce and go lower? The magic eight ball says "Ask again later". Gold and Silver was the theme of the day. 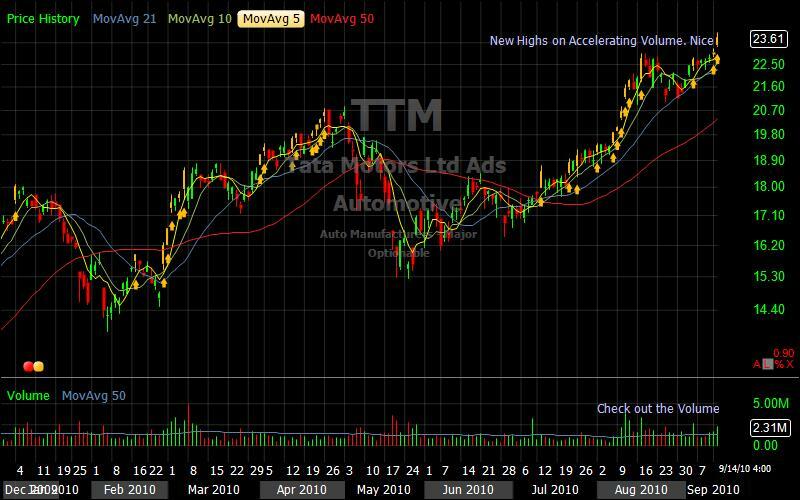 Not many charts with decent setups but I did notice TTM up on higher volume. I didn't take it, yesterday would of been the day to get in. Prior to that 7/22 looks like a decent entry. No Response to "9/14/2010 Evening Review - TTM"